IT WAS ONCE home to priceless archaeological treasures, but these days you get into Mosul museum in Iraq’s second city via a gaping hole in the basement. In the darkness lies a pile of rubble — all that remains of two ancient Assyrian statues of winged bulls, smashed to pieces by Islamic State group jihadists. Iraqi forces announced that they retook the building from IS last Tuesday as they pushed into west Mosul as part of a vast offensive to oust the jihadists from the northern city. Taking the museum was a symbolic victory. 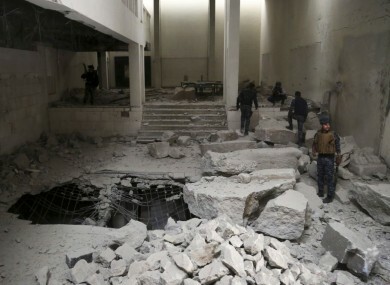 In a notorious video issued in February 2015, the jihadists were seen attacking items at the museum with sledgehammers and pneumatic drills, destroying priceless pre-Islamic artefacts. Today, the museum is in ruins — nothing escaped the attackers. In a darkened hall, a heap of stones marks the spot where tourists once admired two imposing “lamassu” statues, Assyrian winged bulls with human faces. The two-metre-tall monuments weighed more than four tonnes, according to Iraqi archaeologist Layla Salih. In the rubble, what appear to be the remains of carved legs and wings can be seen. Other pieces of smashed stone bear inscriptions in the cuneiform alphabet. Amid the ruins, a hole leads to the basement, where twisted iron bars are visible in the foundations. From time to time, an explosion rocks the building, a plain structure of ochre rock, as Iraqi forces fire rockets at IS positions. On the first floor, two Iraqi snipers huddle behind narrow windows, their weapons trained. An IS sniper is operating nearby. Assyria, with its capital Nineveh in the area of present-day Mosul, was a kingdom in northern Mesopotamia that became one of the most powerful empires in the ancient Middle East. Assyrian art is famous for its bas-reliefs showing scenes of war. As well as the two lamassu, the museum housed a winged lion of similar proportions, Salih says. The three lost sculptures “were among the most valuable pieces in the museum”, she says. The building had housed 100 objects, she adds, and all but six of them were originals. Antiquities weighing more than four tonnes were impossible for them to steal, so they were destroyed on the spot. The second-most important museum in Iraq, the building also housed Hellenic objects dating from centuries before the Christian era. But now, the iron and wood showcases are empty, covered with broken glass. Others mention pottery, marble or alabaster tablets and a Mamluk-era copper candleholder decorated with floral motifs. IS jihadists seized a string of ancient sites in their lightning 2014 advance across Iraq and Syria. After declaring their supposed caliphate that summer, they plundered and destroyed several of them. The jihadists cast their destruction of artefacts as the religiously mandated elimination of idols, but they have had no qualms about selling smaller pieces on the black market to fund their rule. In one video, they were seen using bulldozers, pickaxes and explosives to demolish Nimrud, a jewel of the Assyrian empire founded in the 13th century BC. At Mosul museum, little survived except two massive, dark coffins decorated with inscriptions from the Koran. Salih says they belonged to 13th century Shiite imams. “A restoration is possible, but it will be difficult to know if we will find all the fragments, or if some are missing,” she says. Email “PHOTOS: Priceless remains lie in ruins at Mosul museum”. Feedback on “PHOTOS: Priceless remains lie in ruins at Mosul museum”.